Women farmers represent more than a quarter of the world’s population. Women comprise, on an average, 43 per cent of the agricultural work force in developing countries, ranging from 20 per cent in Latin America to 50 per cent in Eastern Asia and Sub-Saharan Africa. Yet women have less access than men to agriculture related assets, inputs and services. Had they enjoyed the same access to productive resources as men, women could boost yield by 20-30 per cent; raising the overall agricultural output in developing countries by two and a half to four per cent. This gain in production could lessen the number of hungry people in the world by 12-17 per cent, besides increasing women’s income (FAO, 2011). As farmers, agricultural workers and entrepreneurs, women form the backbone of agricultural rural economy in the developing regions, and yet, together with children, they remain one of the most vulnerable groups. With far less access to education and technology, a host of other socio-economic factors have had an adverse impact on the lives of women farmers in recent years. These include the accelerated pace of globalization, the associated policy and institutional changes including economic liberalization and commercialization of agriculture, rapid pace of population growth and urbanization. Rural-urban migration, growing pressure on land, water, agrobiodiversity and firewood and natural disasters associated with climate change have been unfavourable to women in agriculture, and they have often not been able to take advantage of opportunities from new technologies, markets, or contract farming. The constraints and opportunities that women face in agriculture vary across regions and countries, depending on the socio-cultural and agroecological contexts. Despite many policy reforms both at the macro and micro level, gender issues have not received the attention they deserve. Hence, the current situation has to urgently change. Today, there is a growing realization and commitment of the global community to achieve more sustainable and broad-based agricultural growth by addressing gender related issues in agriculture through national, regional and global initiatives and partnerships. 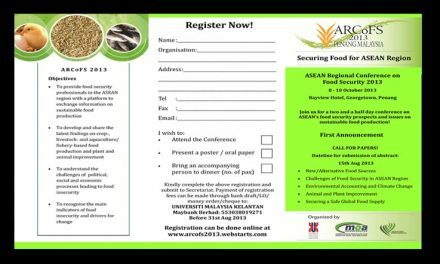 There is also greater convergence of initiatives undertaken by international institutions such as Food and Agriculture Organization of the UN, Global Forum on Agricultural Research, Consultative Group on International Agricultural Research, regional fora and many National Agricultural Research Systems (NARS). The Global Conferences on Agricultural Research for Development (GCARD) Road Map too has called for a radical reorientation of the agricultural research agenda to overcome the existing gaps and to face the emerging challenges of sustainable development and livelihood of resource poor small holder farmers, especially the women farmers. It is, therefore, timely to undertake a stock taking exercise in a holistic manner by drawing on the existing evidence of the impact of policies, institutions and programs to empower farm women and to learn lessons for the future so as to ensure higher economic growth in agriculture sector. With changes sweeping agriculture and other sectors, gender issues have become more important and dynamic. Therefore, it has become necessary for the scientists, policy makers, development professionals and the civil society organizations to understand the issues in national, regional and global context and share their knowledge and experiences to design more focused action for enhancing and harnessing the capability of women who are an important human resource for agriculture in the developing countries. 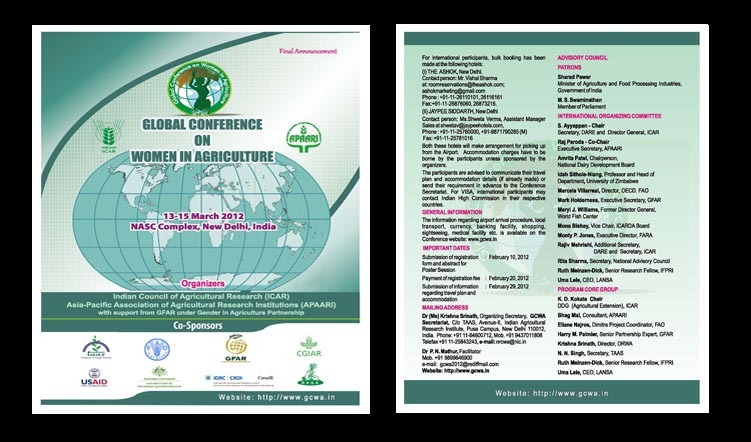 Against this backdrop, a Global Conference on Women in Agriculture (GCWA) is being organized with participation of researchers, policy makers, women farmers and other stakeholders from different regions of the world. To collate lessons on strategies for strengthening gender research in agriculture to make technology generation and dissemination, agricultural planning and policy making gender sensitive and disseminate them through an edited book and develop a Framework for Action. 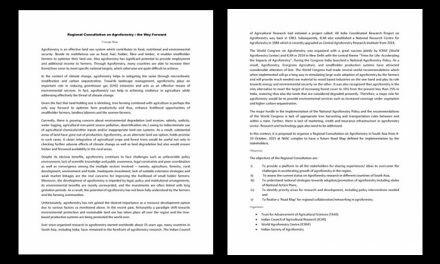 In addition, there will be Working Group discussions to have a Framework for Action on Engendering Agricultural Research, Education and Extension. An enduring global partnership program on gender in agriculture established. Pusa Campus, New Delhi 110012, India. PreviousWorkshop on “Moving Beyond Strategy to Improve Information and Knowledge Management for Agricultural Development in the Pacific Islands Countries and Territories”, 21-24 November, 2011 at Nadi, Fiji Islands jointly by APAARI-FAO-GFAR-SPC.